You will be given a reference e-book to read which has 178 pages And the test will be based on that e-book , you can take final test within 1 year of purchase. Agile software development can be defined as a collection of methods for software development that are mainly based on incremental and iterative development and come with solutions and requirements that evolve around collaboration between cross-functional and self-organizing teams. What makes Agile software development amazing is the fact that it is capable of promoting evolutionary delivery and development, adaptive planning and effective time-boxed iterative approach while also encouraging faster and more flexible responses linked to changes. Agile software development is also known for being a conceptual framework which works effectively in promoting foreseen interactions all through the cycle of development. All the methods used in Agile are also effective in breaking down tasks into smaller increments without requiring a lot of planning. Iterations in Agile are also known as short-term frames that can be expected to last for approximately 1-4 weeks. Iteration in this field requires an effective cross-functional team to perform essential functions including design, requirements analysis, acceptance testing, unit testing and coding. One of the most remarkable benefits of using Agile software development is that it works effectively in minimizing overall risks while also allowing different projects to quickly adapt to changes. 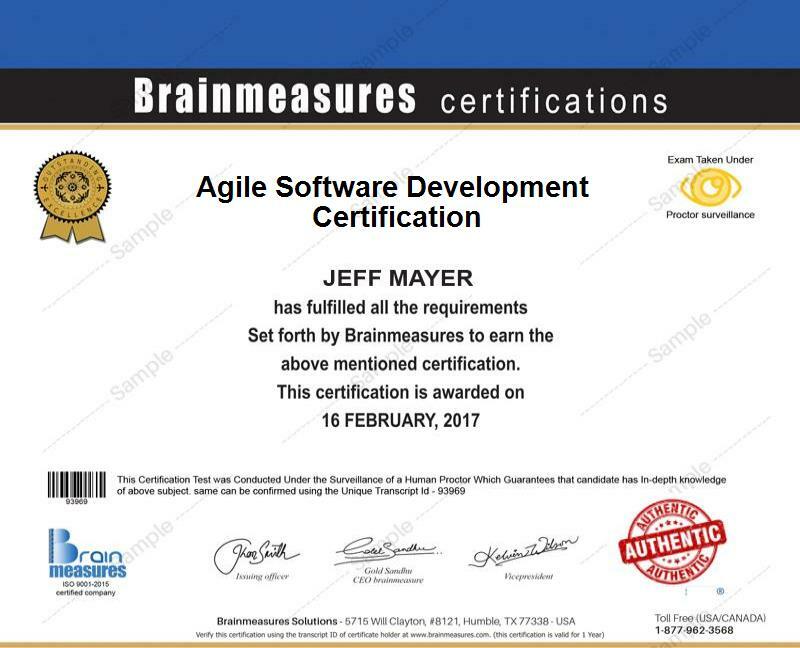 If you plan on becoming a certified Agile developer, then you should know that a popular online certification program offered by Brainmeasures called Agile software development certification course is ideal for you. This Agile software development course is right for you because it works in letting you gain a more comprehensive understanding about how Agile works. It gives you the opportunity to undergo a high quality Agile software development training which gives you a stronger background about all the methods that are used in this field, the major components, tools and elements that you can use in making different Agile methods work in your favour and the different principles that are now used in implementing these methods. You will never regret receiving an Agile software development certificate because it will be a huge help in showcasing your competence and strong background in this field. How to effectively reduce complexities in your project? The Agile software development certification program which you can now easily access at Brainmeasures is developed in such a way that it caters to the needs of hundreds of individuals and professionals especially those who are aiming to enter the programming and development industry. This works perfectly for project managers, software developers, graphic and web designers, software development teams, technical development managers and leaders and anyone who wishes to increase their understanding about the engineering practices used in Agile and its different tools and techniques and how these are implemented. Finishing up an Agile software development certification course can also boost your financial stability. If you use your Agile software development certification to work as an Agile software developer, then expect to earn around $48,000 to $82,000 annually. You can also use it to get the position of an Agile business analyst which is a huge help in earning approximately $60,000 to $97,000 yearly.